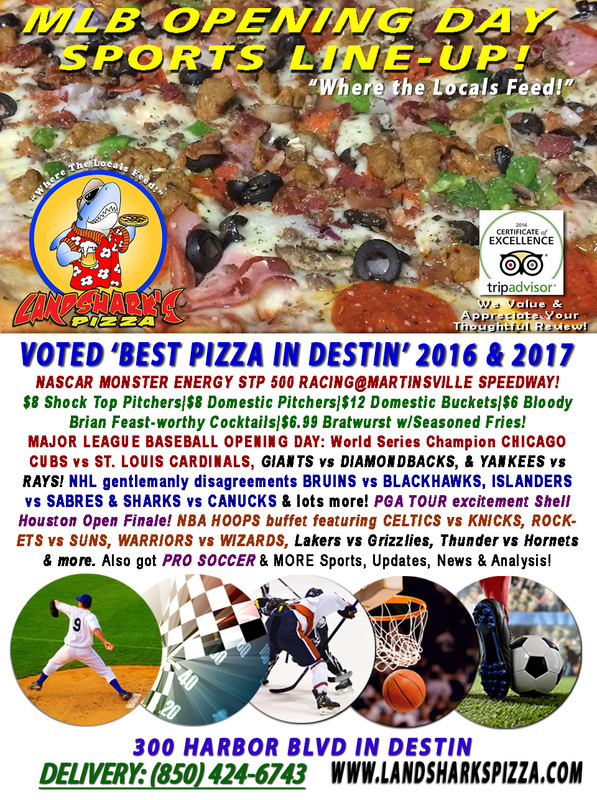 / Best Cheeseburger in Destin / NCAA National Championship GONZAGA vs NO. CAROLINA|MLB, NBA, NHL Burger & CRAFT BEER TASTING@6PM! NCAA National Championship GONZAGA vs NO. CAROLINA|MLB, NBA, NHL Burger & CRAFT BEER TASTING@6PM! This is it – the final battle for supremacy between the two best Men’s College Basketball teams in the country. Landshark’s is whomping up a burger grilled your way that’s a hot, juicy, cheesy, melty feast accompanied by succulent seasoned fries (’til 5PM, $6.99 dine-in with drink purchase)! 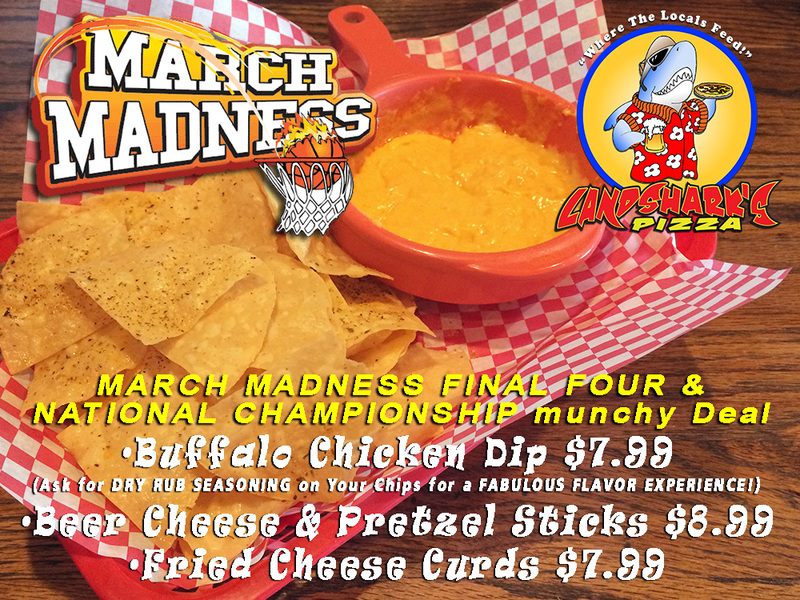 $8.99 Beer Cheese & Pretzel Sticks! 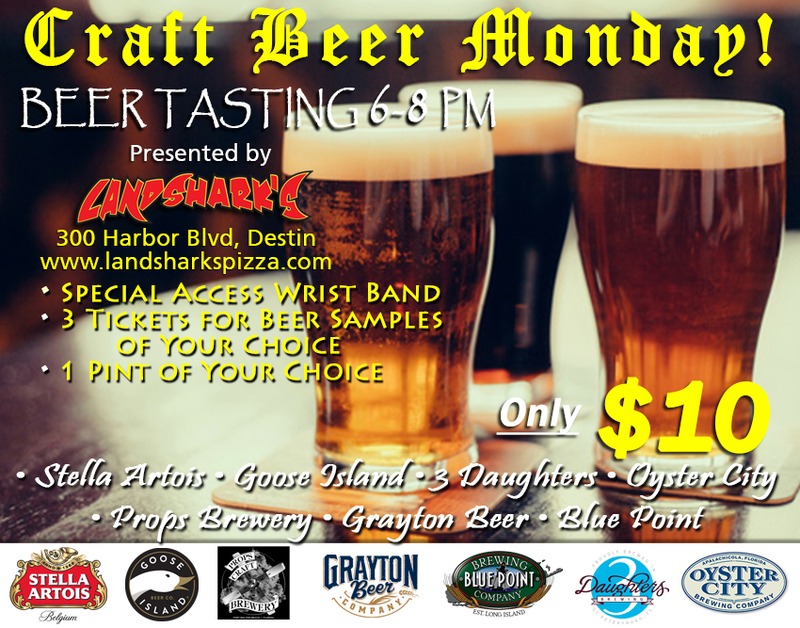 CRAFT BEER TASTING’ before that game starts at 6PM – Join in for ONLY $10 – Includes All-Access Wristband, 3 Tickets for sampling the Craft Beer Monday selections of your choice, 1 Full Pint of the Craft Beer of your choice! KILL THE KEG STILL AVAILABLE – TAKE ADVANTAGE WHILE IT LASTS! 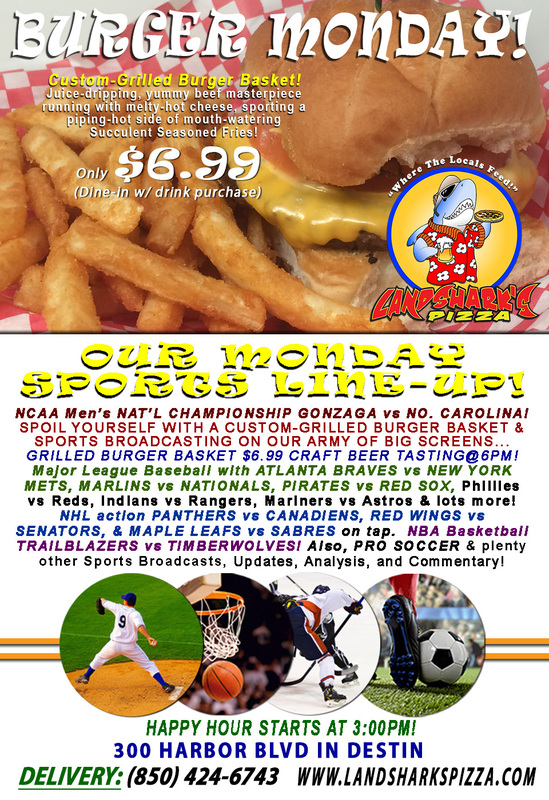 HOT SPORTS ON OUR ARMY OF BIG SCREENS – Major League Baseball with ATLANTA BRAVES vs NEW YORK METS, MARLINS vs NATIONALS, PIRATES vs RED SOX, Phillies vs Reds, Indians vs Rangers, Mariners vs Astros & lots more! NHL action featuring FLORIDA PANTHERS vs MONTREAL CANADIENS, RED WINGS vs SENATORS, & MAPLE LEAFS vs SABRES on tap. NBA Basketball featuring PORTLAND TRAILBLAZERS vs MINNESOTA TIMBERWOLVES! Also, PRO SOCCER & plenty other Sports Broadcasts, Sporting News, Analysis, and Commentary! NASCAR This Week: XFINITY Series Bariatric solutions 300 (Saturday April 8th) & Monster Energy Cup Series O’Reilly Auto Parts 500 (Sunday April 9th) at Texas Motor Speedway. Don’t bother getting out of bed! AMERICA IS GREAT AGAIN BECAUSE WE BRING THE AWARD-WINNING FOOD TO YOU AT HOME (or vacation condo, etc.). Delivery starts during the lunch hour BRIDGE TO BRIDGE in Destin! Give us a call at (850)424-6743 for more info! in Destin! 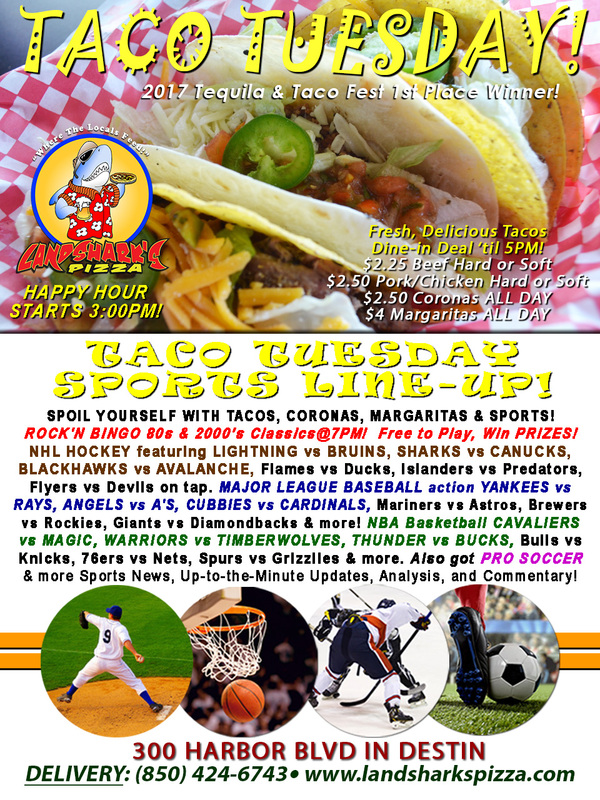 Previous Post: « MLB OPENING DAY & NASCAR Race-time SPECIALS, Pro Hoops, Hockey, & Shell Houston Open Final!